A foreboding cold air threatens Westeros as the Night King and his fearsome army loom ever nearer. Following on from Montegrappa’s celebrated 2017 tributes to Game of Thrones, Winter is Here heralds a new mood and the sense that things will never be the same again. The new and luxurious Winter is Here collection will be premiered at the MEFCC Show in Dubai (11-13 April), the main pop culture convention in the Middle East. Launched by Montegrappa in collaboration with HBO® for the long-awaited eighth season of Game of Thrones (aired from April 14). The soul of Winter is Here has a dual nature, half a writing instrument and half an object d’art. The new, limited-edition Winter is Here is carved from pearlised grey celluloid and enveloped by a masterful study in the ancient art of lost wax casting. The figures of the King of the Night and that of the White Walker are engraved with meticulous detail on the pen’s barrel, and their cold and mysterious eyes shine in the brightness of the ice-blue apatite crystals. The disquieting figure of the ice dragon Viserion, carved in precious metal, hovers over a ring of blue-crystalline hand-glazed flames. 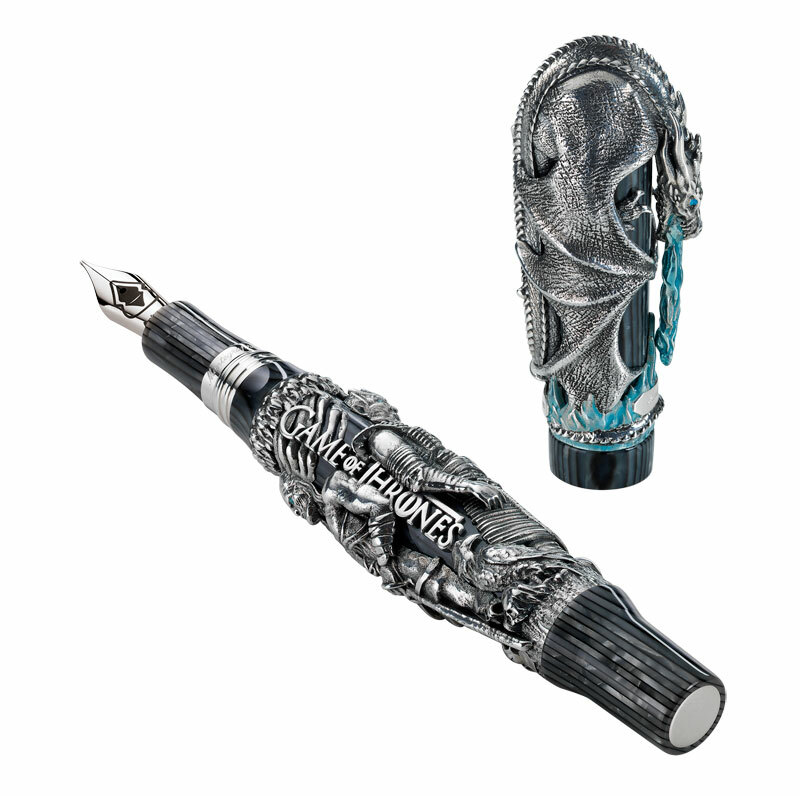 Its figure wraps the pen cap completely and the creature’s head with the tongue of ice coming out of his mouth acts as an innovative pocket clip.The mysterious seal of the King of the Night is engraved on the fountain pen 18K gold nib. 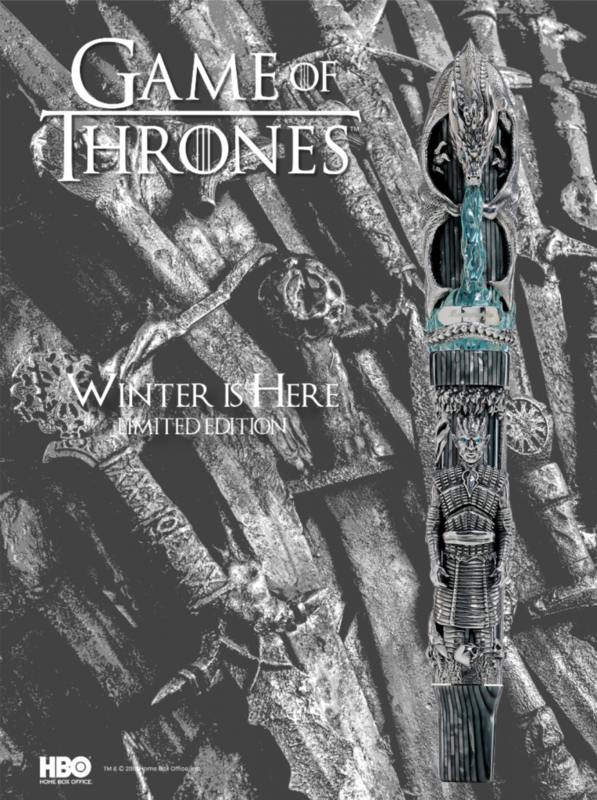 Dressed in armour of 18k gold, seven fountain pens and rollerballs signify the kingdoms of Westeros, while 300 sterling silver pieces in each mode denote the year of settlement of the Targaryen Kings (300AC). Both editions are presented in a deluxe black case of lacquered wood, regally embellished with the Game of Thrones insignia. Book sales of more than seventy million copies and the decade’s most talked-about television series make Game of Thrones possibly the greatest pop cultural phenomenon of our age. The moment of reckoning is near. Be prepared.